A giant paper-mache pig that appeared on the corner of State and Exchange Street in Bangor yesterday has already begun to attract significant attention, with a steady stream of passers-by stopping to comment on and take photos of the work of public art. Normally, sculptures in public spaces like this would have to be approved by the city’s Commission on Cultural Development, but not this particular porcine installation. That’s because this is a pig with a message. “School Budget” reads a sign on the side of the happy-looking pig. “VOTE NO” is written on its tongue. Because our curly-tailed friend is expressing a viewpoint on an upcoming election, he counts as constitutionally-protected political signage. According to City Councillor Ben Sprague, who checked with the City Manager after I inquired about the artwork, no city ordinance or state law prohibits car-sized political pigs on public property. A sheaf of full-color fliers attached to the side of the pig makes its political position clear. 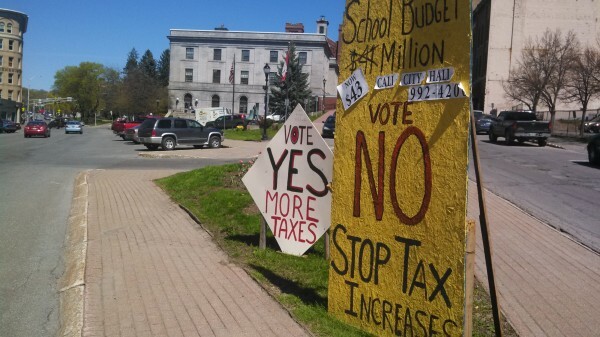 They advocate against the upcoming vote to ratify Bangor’s school budget (and use some misleading tactics to do so, such as comparing statewide averages for teacher salaries with the average for all teacher compensation, including health insurance and other benefits, in Bangor). Nowhere on the sculpture is a disclosure of who constructed or paid for the pig. Although referendums in Bangor (and other Maine cities with populations of more than 15,000) fall under the auspices of state campaign finance laws, individuals and groups intervening in ballot questions only need to identify themselves on their signage and materials if they make an expenditure of more than $500. Despite its creativity, the pig’s message is unlikely to be persuasive. Last year, Bangor voters ratified a comparable level of school spending by a nearly two-to-one vote, despite some strident signage in the same location. The biggest effect of the installation of the pig may be to prompt more public artistic/political expression in Bangor. One question remains: as it seems that the pig will likely be a prominent part of the city landscape until June, what should we call it? Feel free to suggest a name right here.